Patterns of bodily movements are imprinted in the memory of human beings, they are our inherent characteristic and what makes us human. Instinctive gestures of our bodily interaction with space and gravity define our being in the world. Expressions of the body through rigorous movement patterns can be seen as attunement to basic, archetypical principles of life. There are certain ways in which we can move our body and mind to create almost alchemistic transitions and fluid dynamics of movement through space and time. 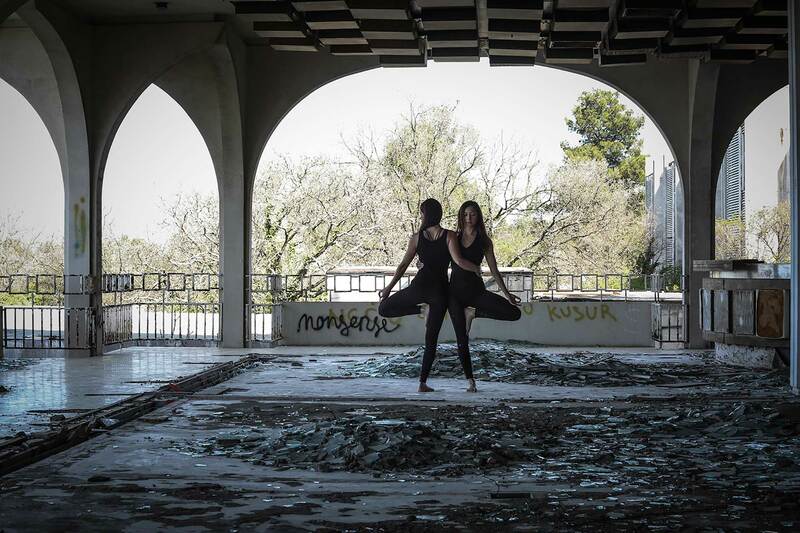 And what is yoga if not a geometric movement of the body in the space we inhabit? If we look at Ashtanga yoga, we can observe it as a certain momentary »body architecture«, we can enjoy the aesthetic of its static positions and several transitions. I propose there is a similar dynamic in the exchange of the static and transitioning mental states happening inside the human psyche that can be described as a momentary architecture of the mind. Not only the body, also the mind moves in patterns and the more we repeat the pattern, the more probability we create to automatically repeat it again. Re-patterning or at least stopping and observing the circles of repetition is a domain of Ashtanga yoga. Sacred geometry captures a dimension of observation of the natural patterns appearing and disappearing in the micro and macro cosmos. The cells, the fetus, the galaxy and many other phenomena have a certain geometry imprint that is similar or as one may say universal. And this idea is the cornerstone of our project. 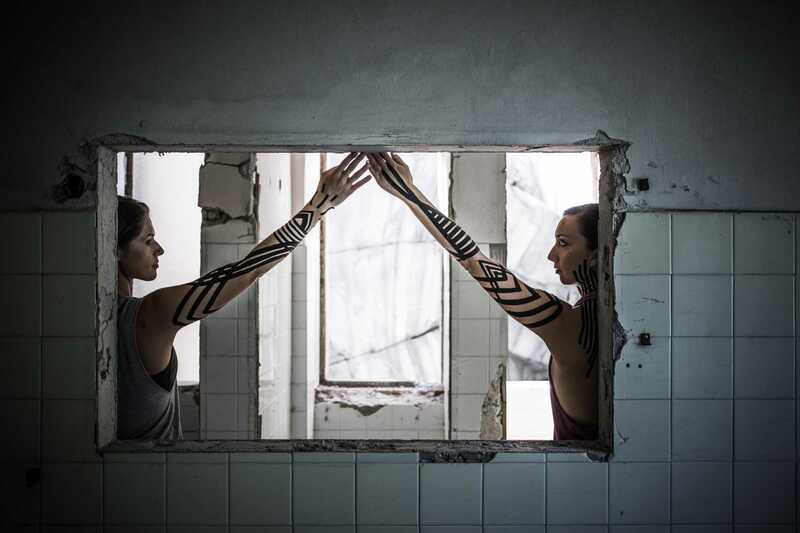 The Sacred geometry project reached its epilogue in an old, abandoned youth home in the north of Slovenia, with the aim to research the relation of body, uninhabited space and the tape patterns on the skin surface. 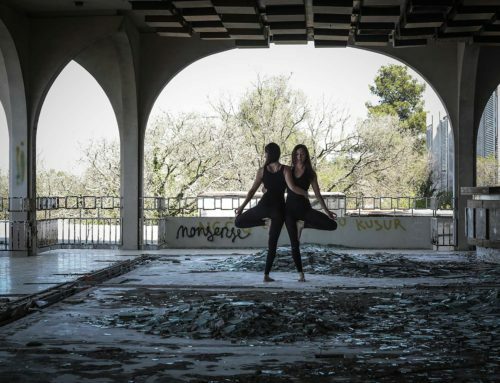 We explored the connections of geometrical shapes that are present in the forms of abandoned architecture, yoga positions and inspired patterns of kinesiology tape applied on the surface of the skin. Joining this triple idea about different surfaces opened up a question of the interaction of inner and outer patterns. The idea of the project deals with the universal geometrical patterns of the space, body and tape patterns on the skin surface. The interplay between outer and inner, body and emotion, proposes a question how to make the internal state visible in the universal geometric shapes. How can an internal state become visual in a geometric shape on the body, is one of the questions that the project proposed. In collaboration with the Italian artist Carlo Galli, we searched for the answer by using the body as a plane surface for the geometric works created by using kinesiology tape. Galli created 3-dimensional geometric shapes on the skin, following the inspiration of sacred geometrical shapes. 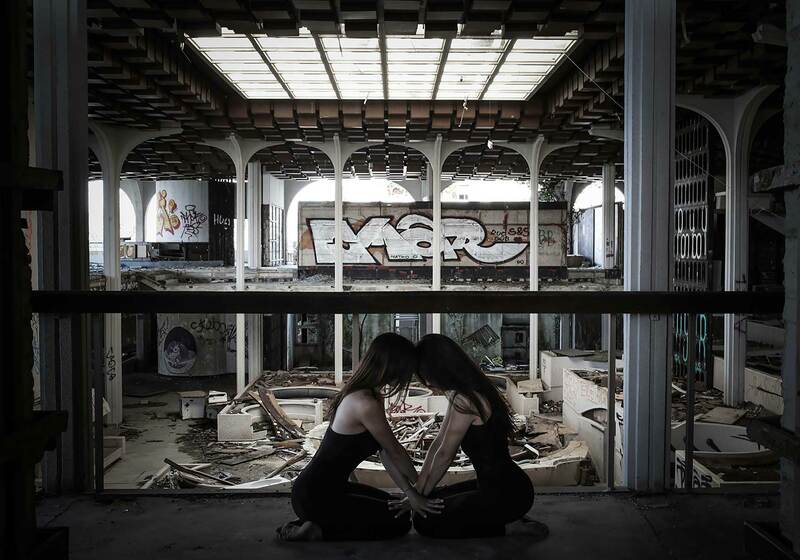 In an interplay of outer tape works and inner shape, we created a dialogue of body as a space inhabited by emotional states. Within this triple exploration of the space, we created a dialogue, some kind of visual discussion of the inner and outer spaces.